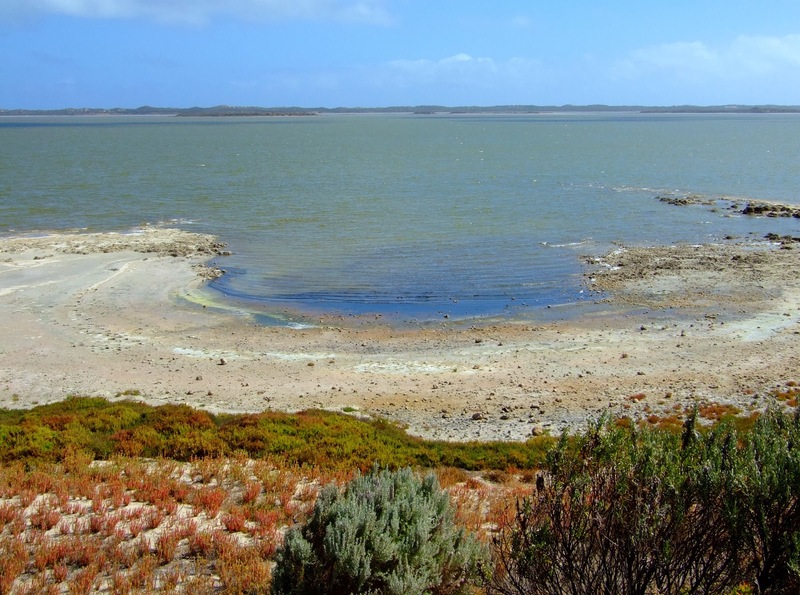 The Coorong ... this is where we'll be. But first, we have to get there! On the road to Strathalby, and wouldn't you know it? Looks like rain! 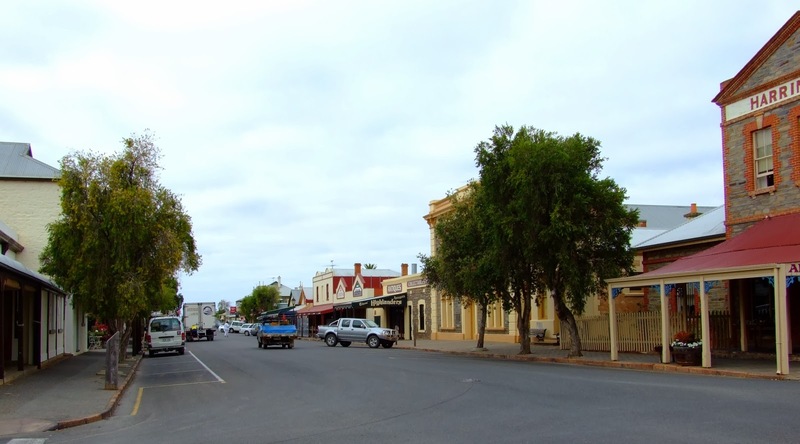 A quiet backwater of Strathalbyn, and we're looking for a place to stop for a late breakfast. St. Andrew's church overlooks the whole town, with its population of little corellas, or "blue eyed cockatoos." Salt pans off the roadside by Dog Lake and Boggy Lake, as you run through to Wellington. 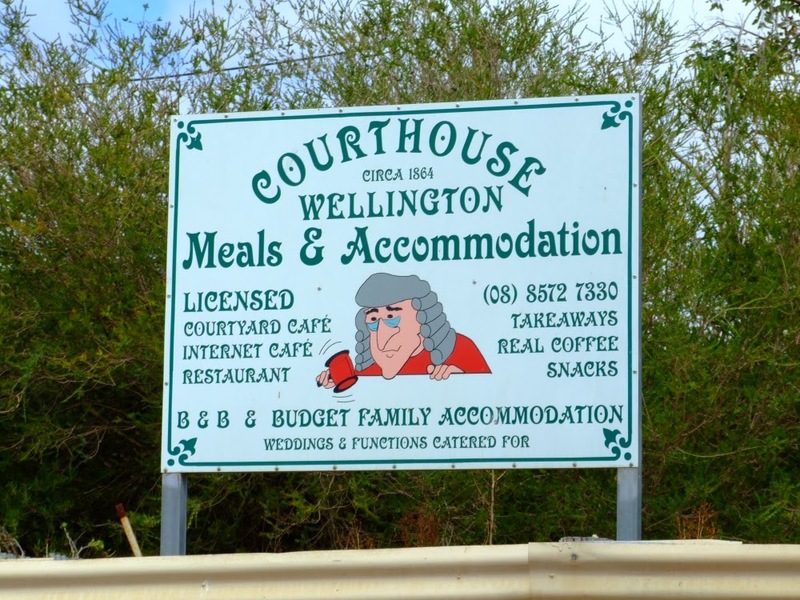 What's at Wellington? 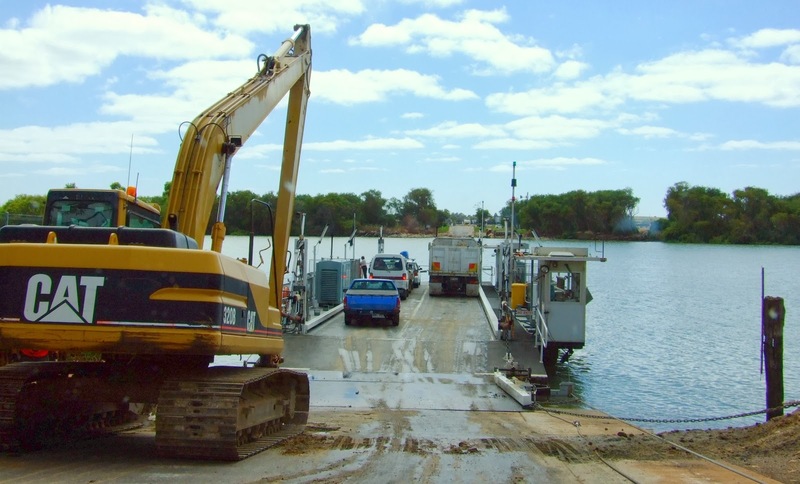 Well, for a start, the ferry! 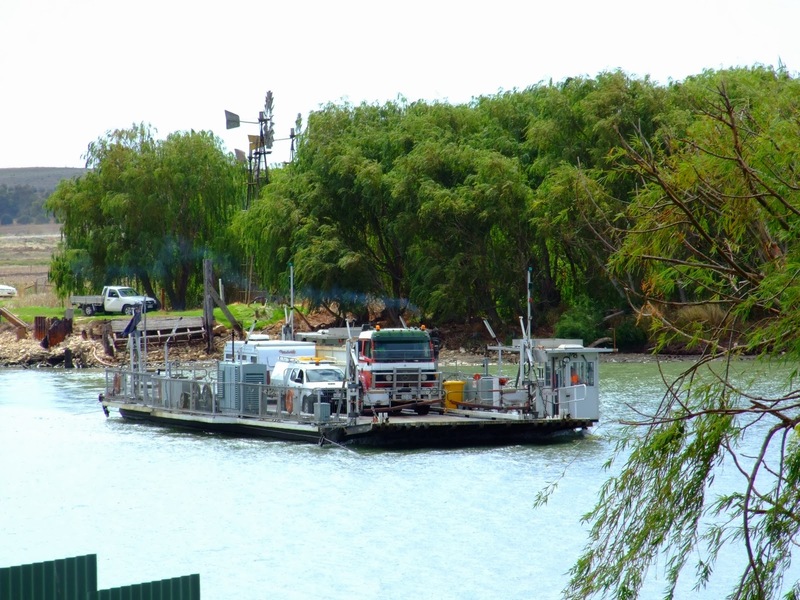 The only way to cross the Murray River, this side of Murraybridge. 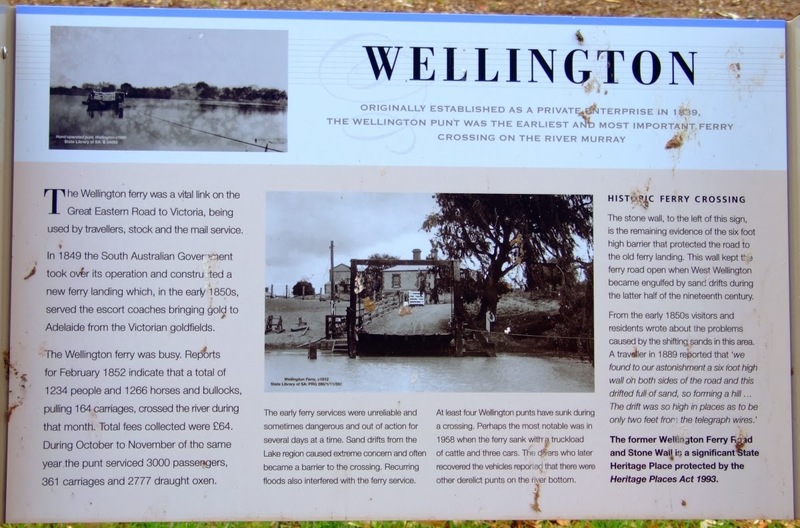 The Wellington ferry runs every 10 or 15 minutes, and is free. 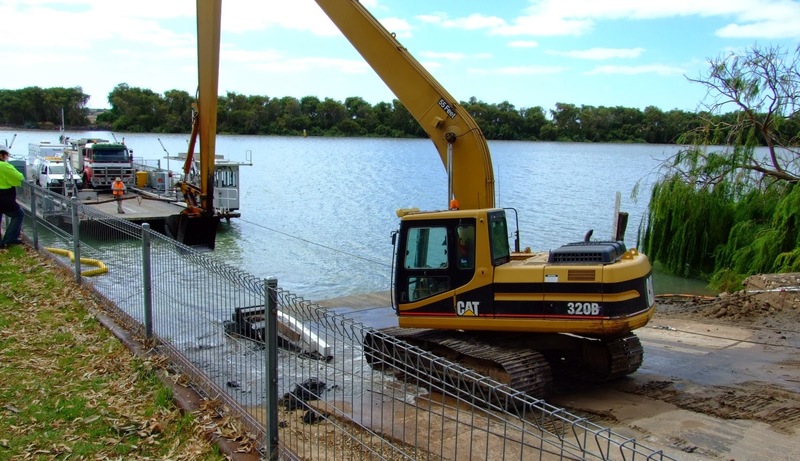 Every kind of vehicle crosses the river this way. 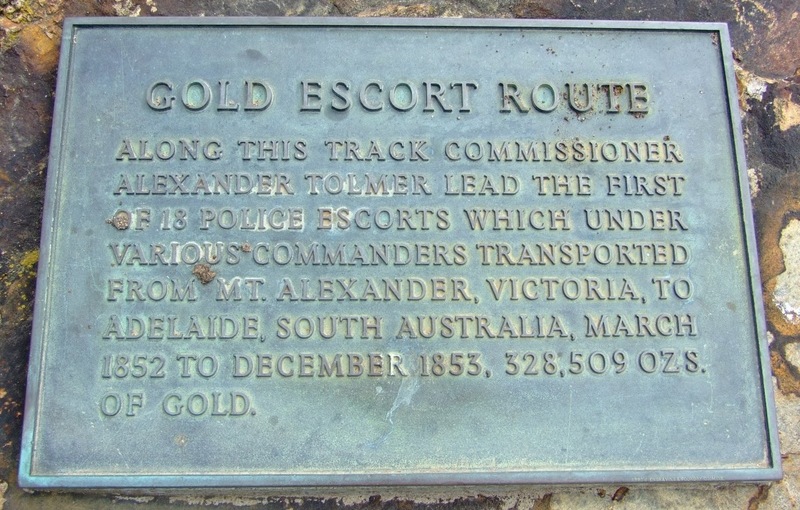 A little history, while we wait for the ferry to come back across. Catch up with the history of the town, and stretch the legs. In fact, a B&B and cafe ... now, there's a thought! 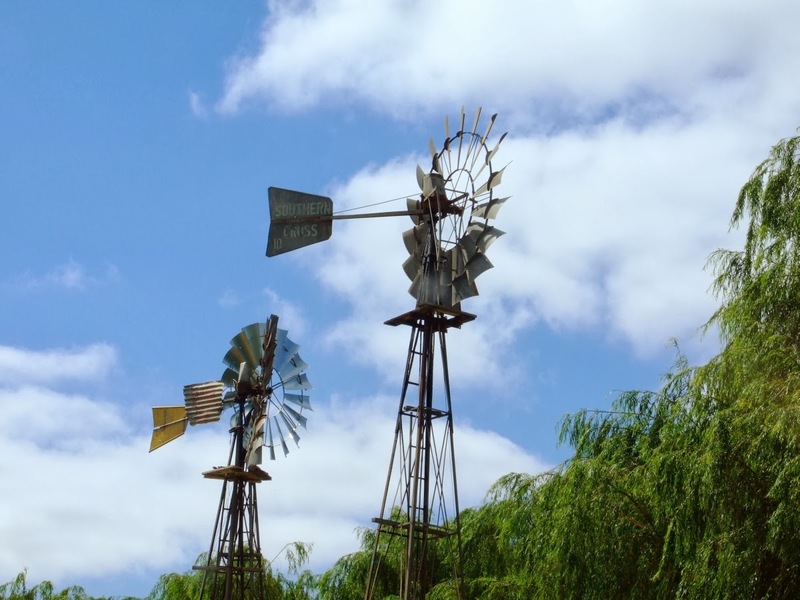 Windmills on the Tailem Bend side of the river. Now, where are we going? 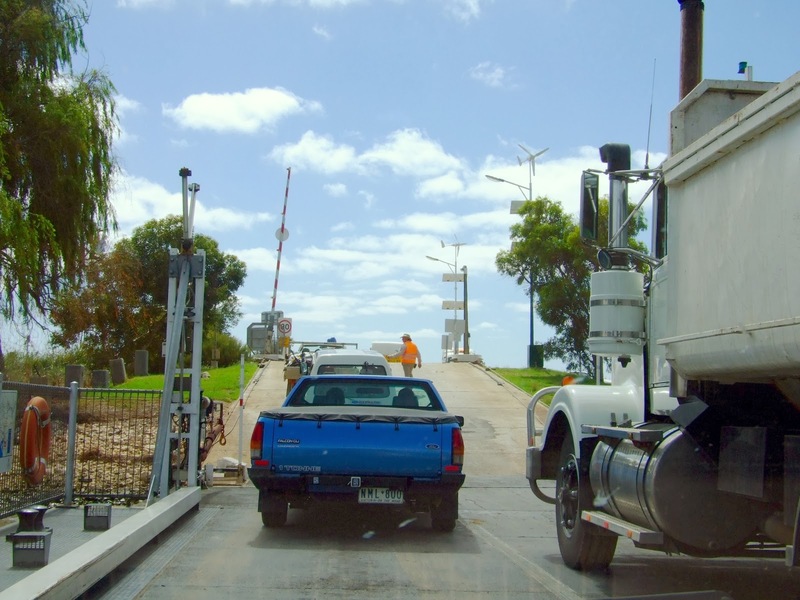 Tailem Bend first. And we seemed to leave the clouds behind as we headed east. 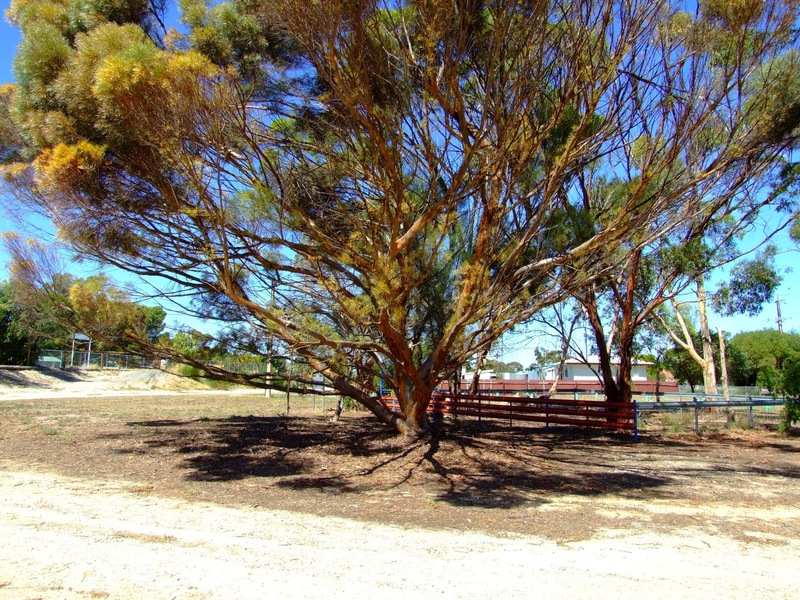 By Tailem Bend, the sun was shining. 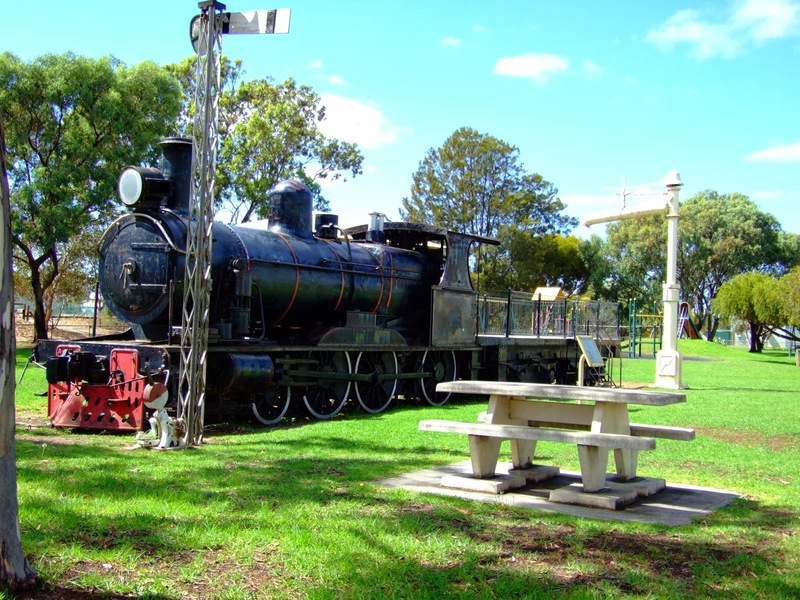 Tailem Bend used to be a railway town ... an old steam locomotive still stands in the playground. You pick up the Dukes Highway, head east, and put the foot down! Silos tower beside the road; the railway is just on the other side of these. very impressed by the safety of this road: great visibility and signage. 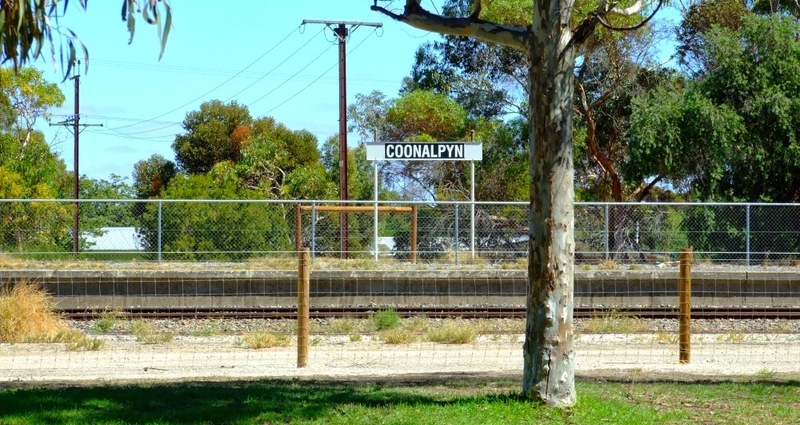 Coonalpyn: an agricultural center where fields stretch to the horizon on either side of the road. And soon enough we're moving again -- next stop, Keith. The only possible downside to planning these road trips a long way in advance is that when the time comes, you have to take the weather as you find it. 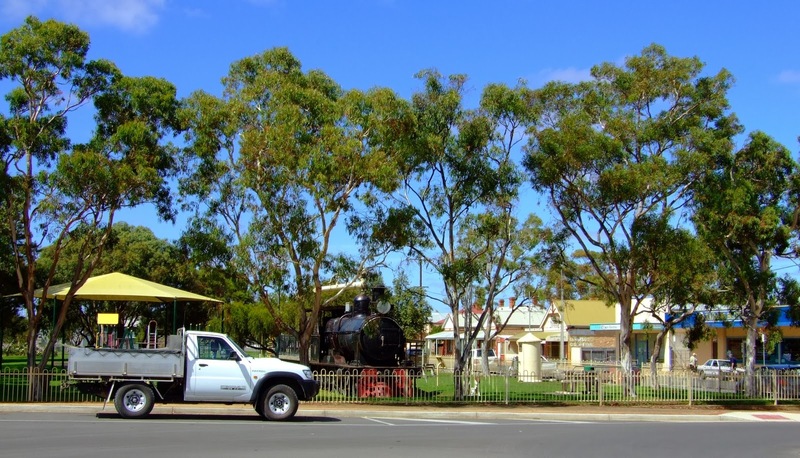 We thought we'd "picked it wrong" as we set out: skies were gray and it looked like rain, all the way to Strathalbyn, where we stopped in the park for a late picnic breakfast. 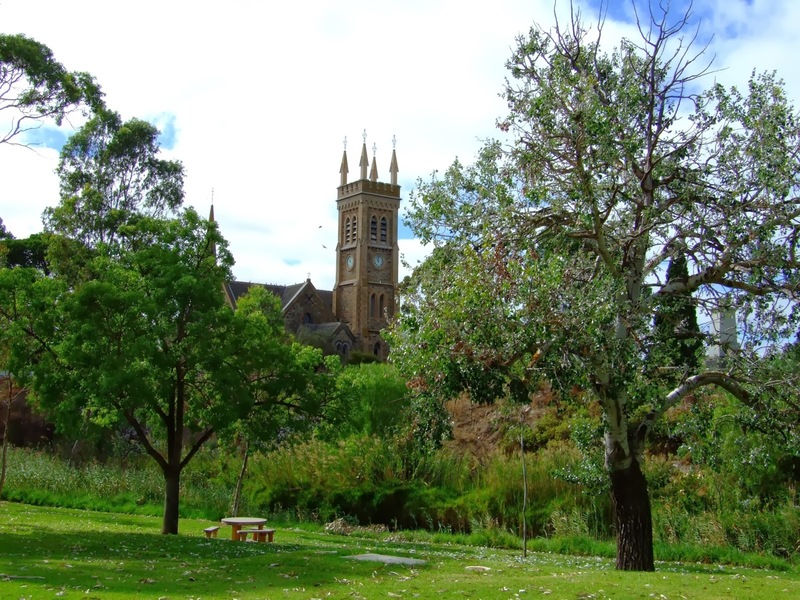 The view of St Andrew's is lovely from any angle, and the little corellas -- "blue eyed cockatoos" -- were swooping and calling everywhere. They're all over Strathalbyn, and Wellington too, nothing the locals can do about them, and why should they? 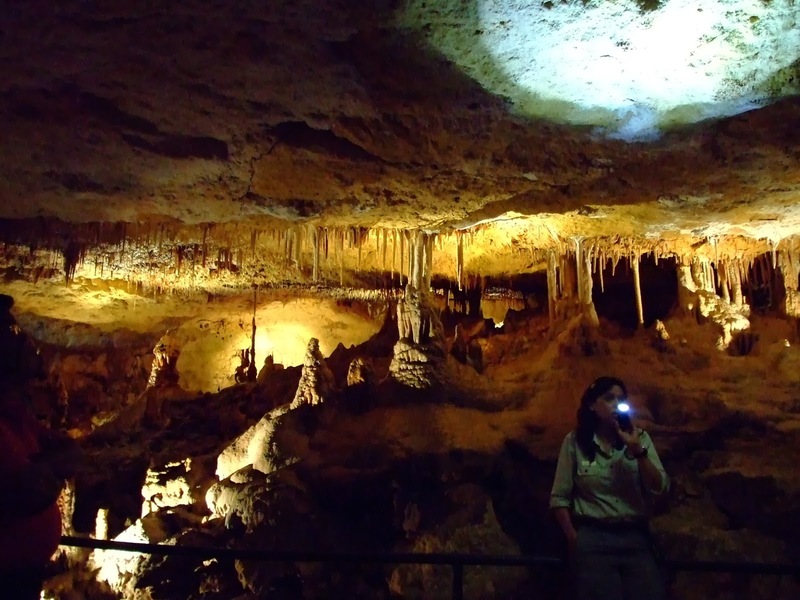 The birds were in these locations before humans arrived! 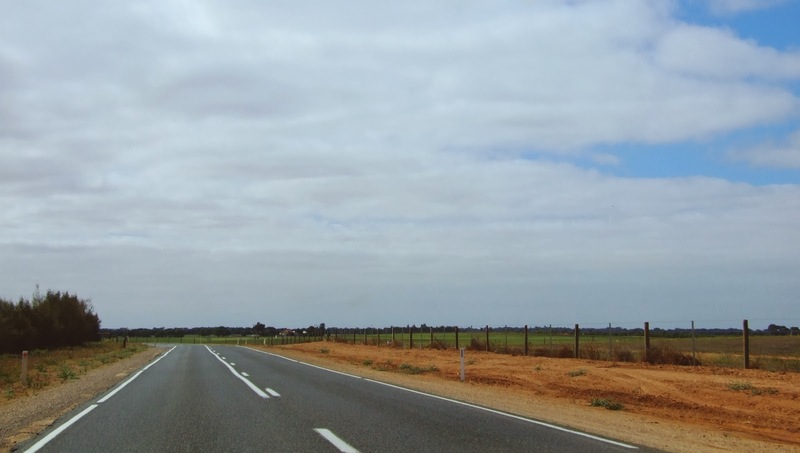 But the skies cleared as we headed east, and by the time we reached Tailem Bend the sun was shining. 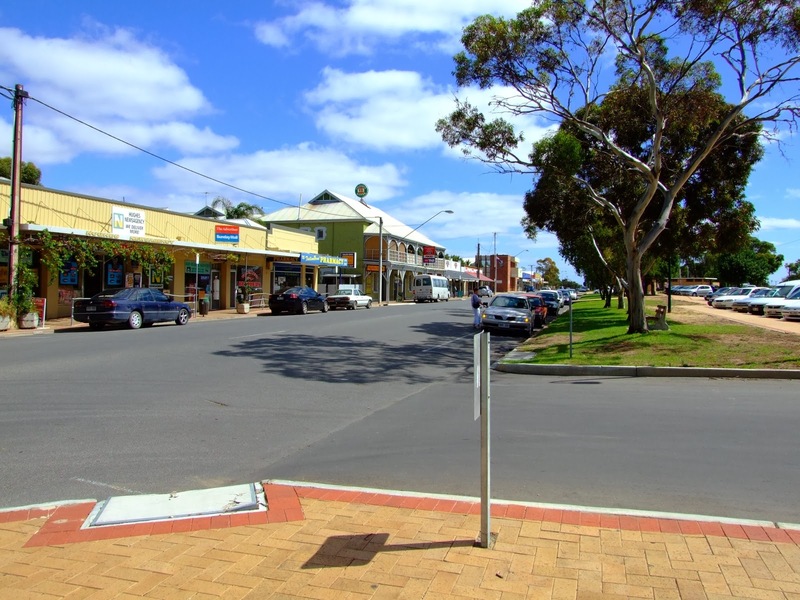 Tailem Bend is quite an interesting town, and has a neat page of its own. 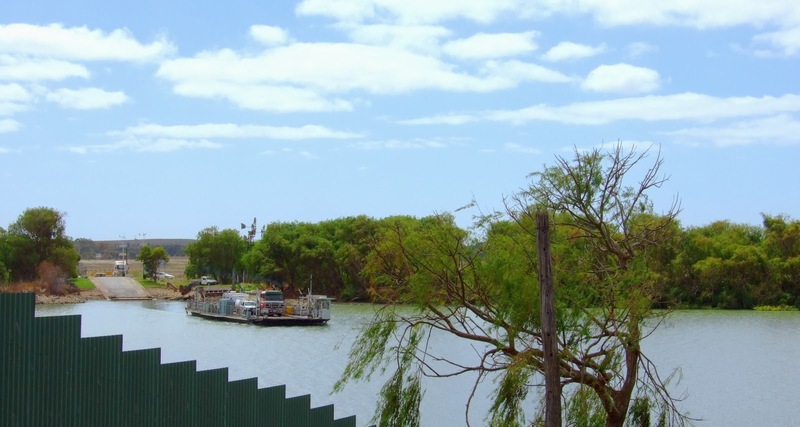 But we were only stopping for lunch and a cool drink before we tackled the Dukes Highway. The Dukes is characterized by its "miles and miles of miles and miles." 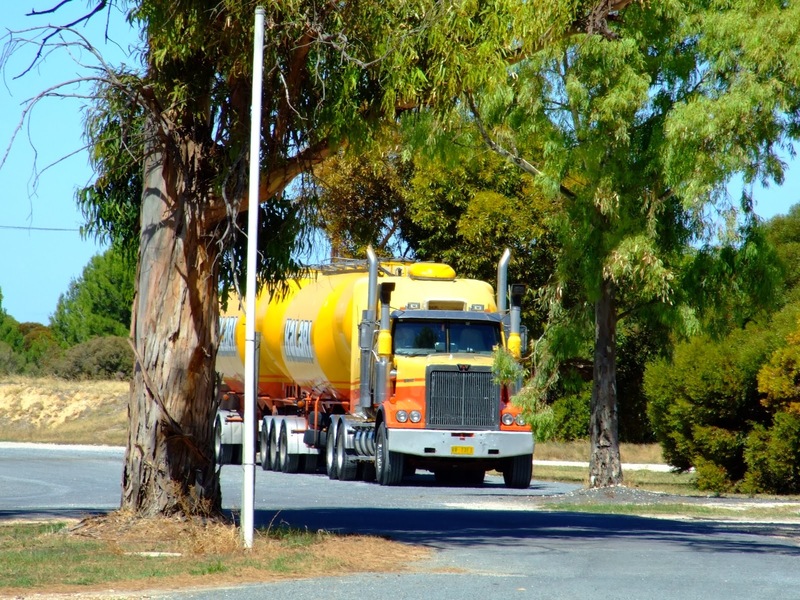 It's a loooong haul from Tailem Bend to Naracoorte, and the tiny towns (blink, and you really will miss them) are spaced far apart, little centers with names like Cook Plains, and Coomandook, Coonaplyn and Culbara, and at last, Tintinara -- a place that doesn't start with a 'C'! 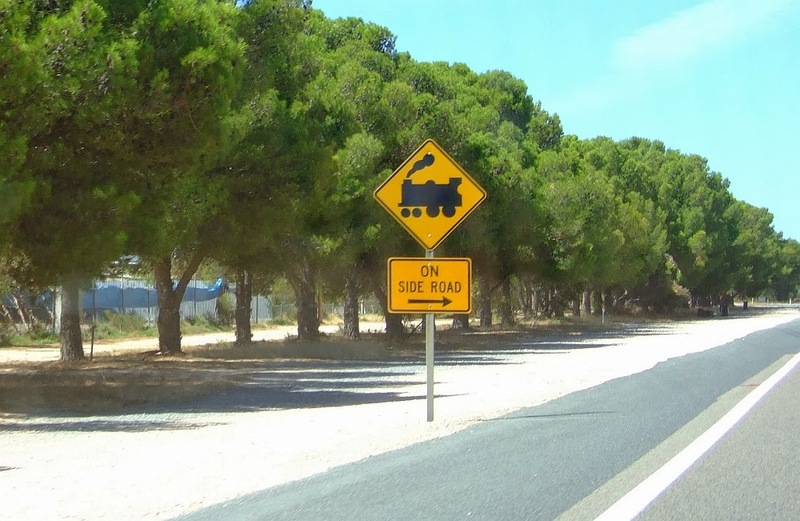 It's all wheat and the railway in this region, and you just have to "lead foot it," and get through ... fortunately the road is wide, visibility is great and the signage is excellent, so it's a safe drive, though it is a long one. 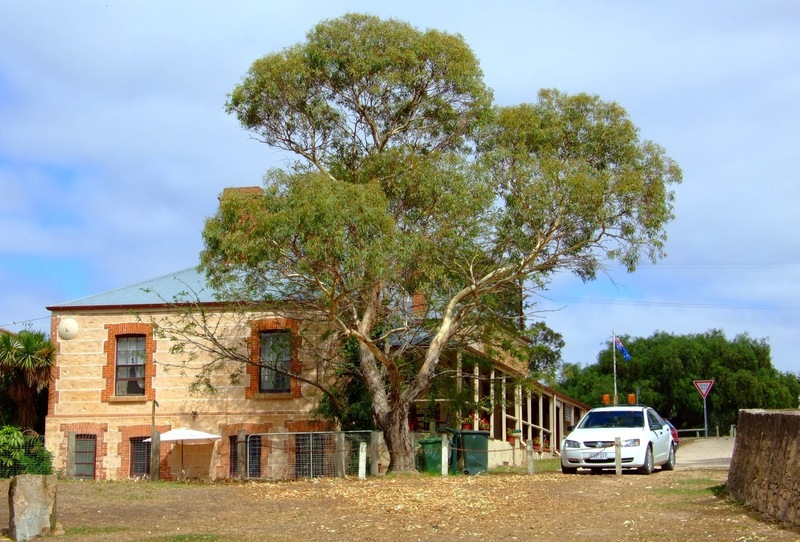 Next stop: Keith, an oasis of green amid the parched summer landscape ... and a Land Rover on a pole ... after which, Naracoorte isn't far away! 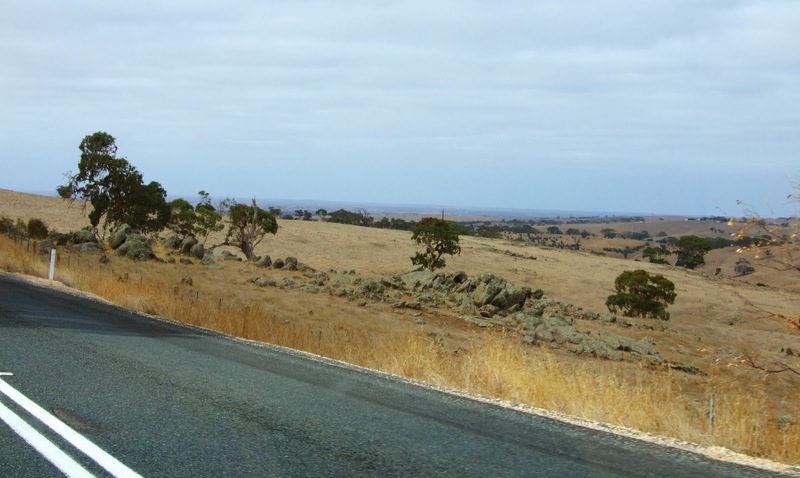 Here's Dave's account of this part of the trip: "Sturt to Strathalbyn," and "Tailem to Keith."